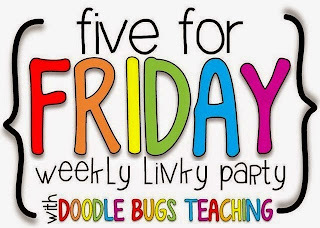 I'm back for some Five for Friday! I found these chalkboard clips at Dollarama and fell IN LOVE. I decided to use them for our cubbie bins this year! These would also be great for your writing wall too! 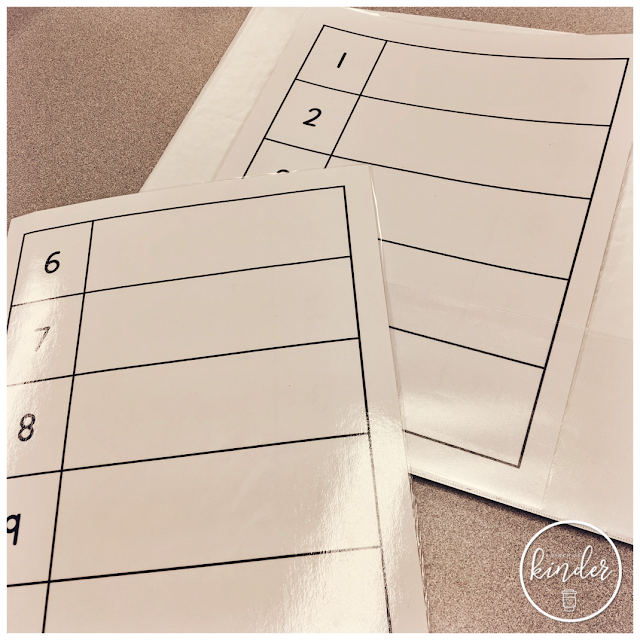 I wanted some tactile number cards but all the options I looked at online were pricey.. so I made my own! I bought these felt stickers and wooden rectangles from Michaels. To make them, just peel & stick! Easy peasy! The pack of felt stickers has letters and numbers so I'm planning to make an alphabet set soon! 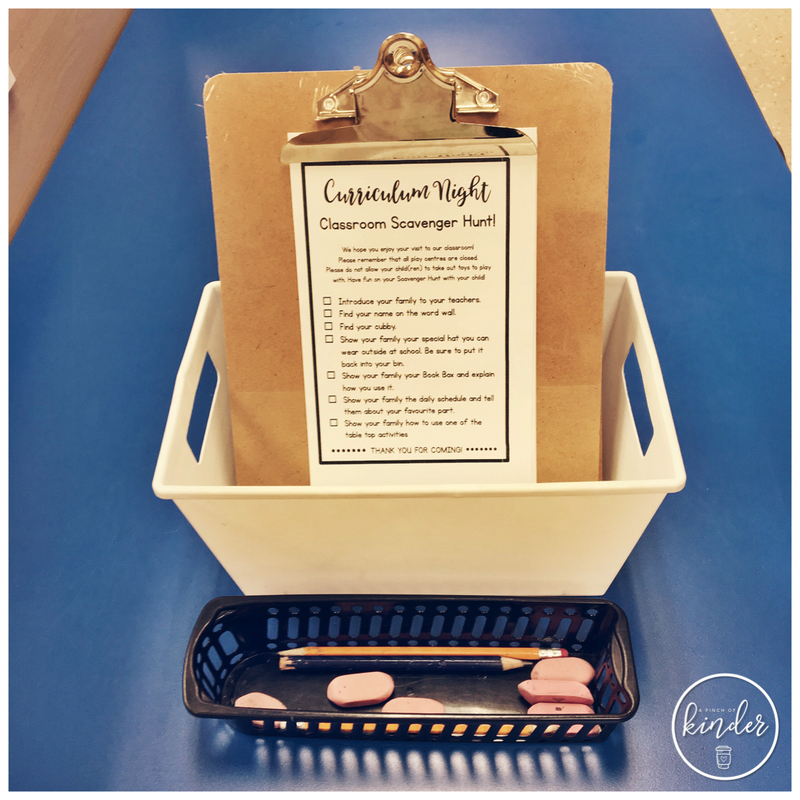 Salt writing has been a hit in my classroom! They have been making letters, numbers, shapes, lines etc! This was the first salt tray activity we did. The rocks and tray is from Dollarama and the wicker basket is from Value Village. 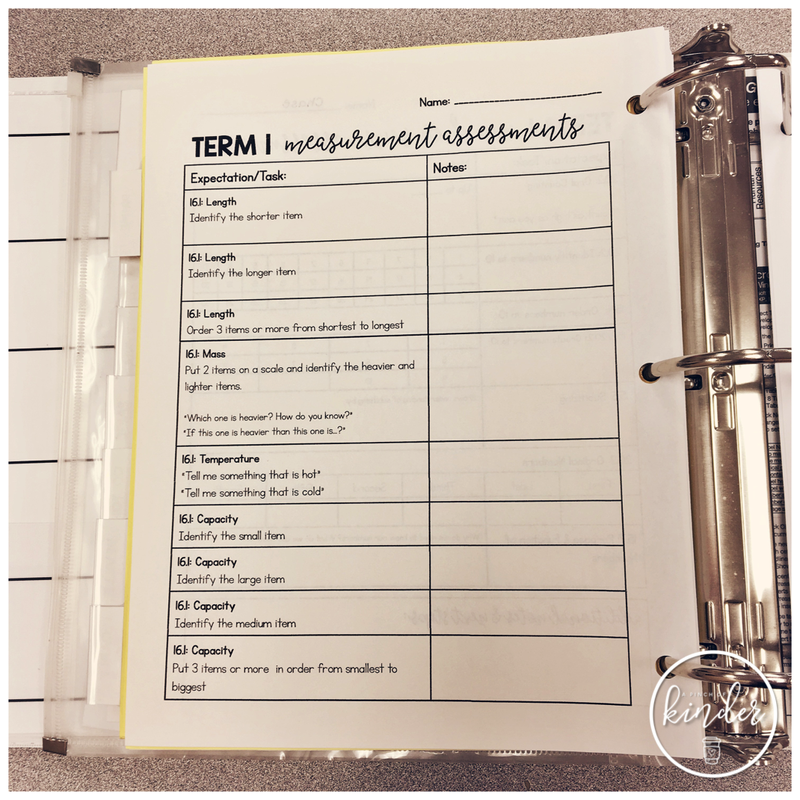 I had the students write with their fingers or paint brush but, q-tips work even better! Ever since we discovered how well the q-tips work we have been using q-tips! 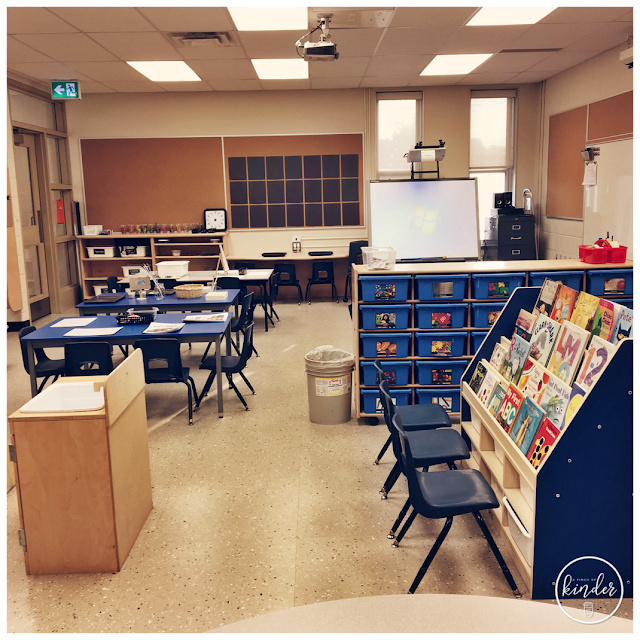 Here is another centre that is perfect for the beginning of the year! I set out a basket of pom poms with a variety of fine motor tools (clothes pins, different tweezers). 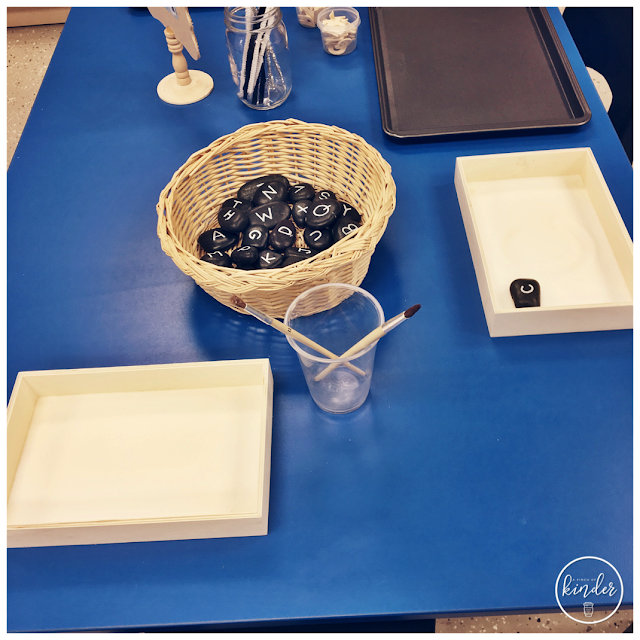 The students were encouraged to collect pom poms and count them. We had our Curriculum Night (i.e. Meet the Teacher Night) and my teaching partner shared this awesome scavenger hunt idea for it! 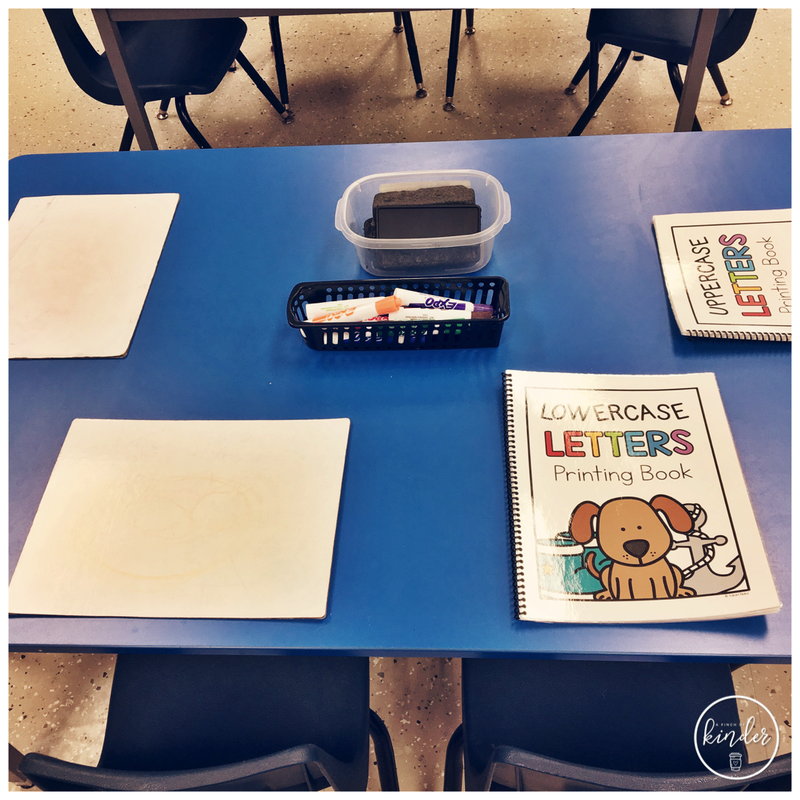 We hope you enjoy your visit to our classroom! Please remember that all play centres are closed. Please do not allow your child(ren) to take out toys to play with. Have fun on your Scavenger Hunt with your child! - Introduce your family to your teachers. - Find your name on the word wall. - Show your family your special hat you can wear outside at school. Be sure to put it back into your bin. - Show your family your Book Box and explain how you use it. 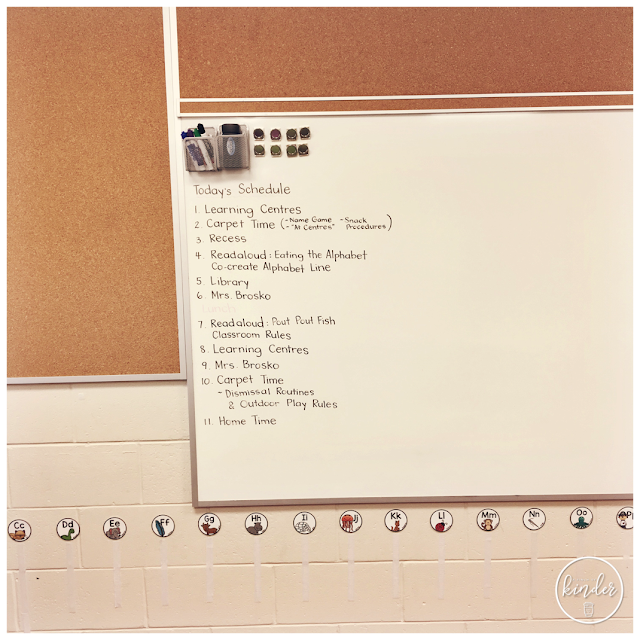 - Show your family the daily schedule and tell them about your favourite part. 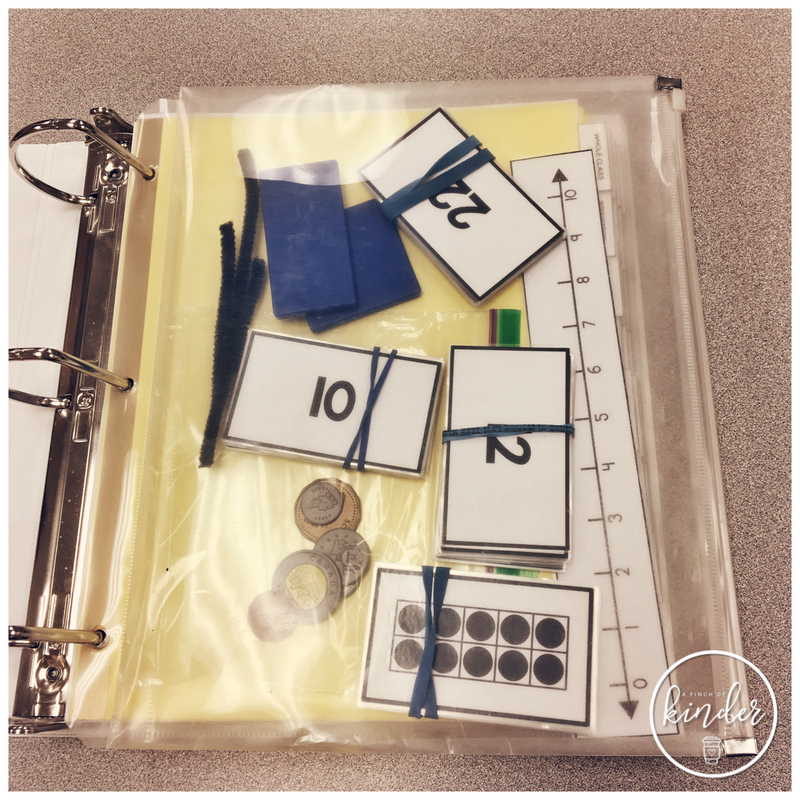 - Show your family how to use one of the table top activities. This was a huge hit! The families who came loved it! 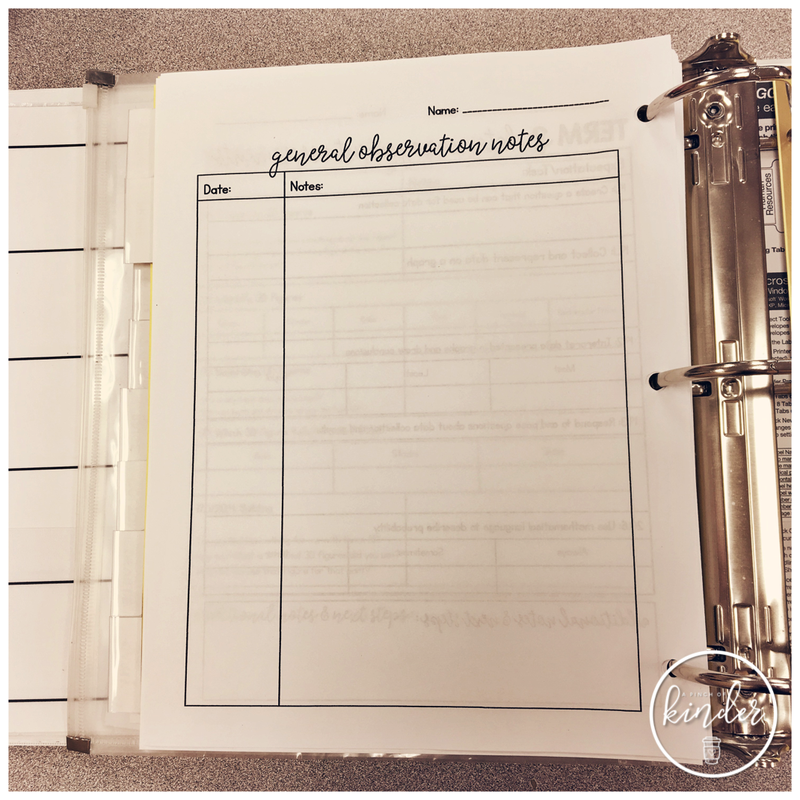 I hope you were able to snag some ideas you can incorporate into your classroom! 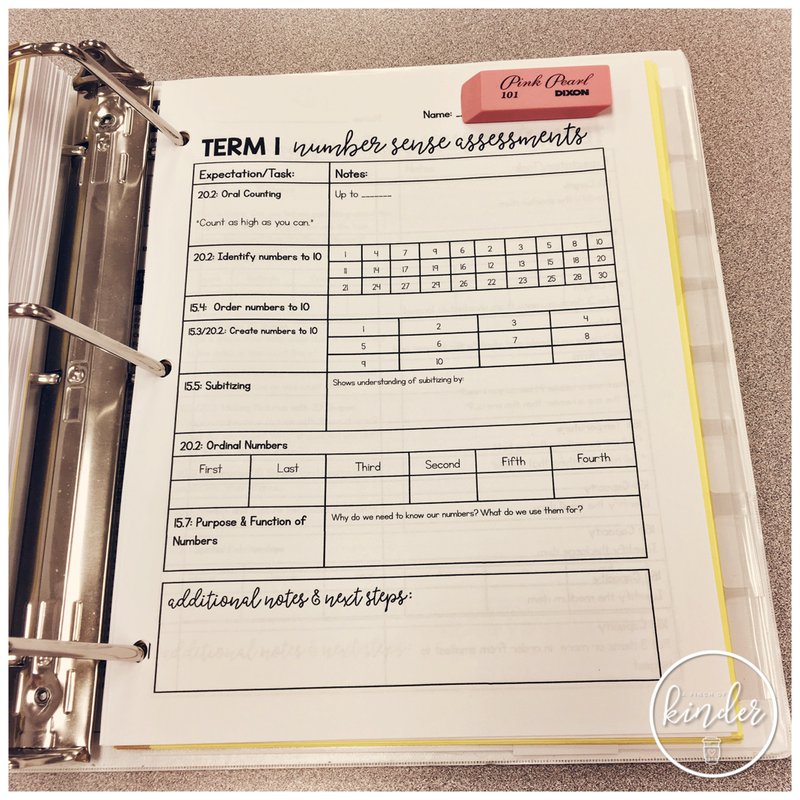 I'm sipping on my coffee and recapping the BH Teacher Week Link-Up that was originally on Instagram! On Monday we were asked to post a few facts about ourselves. Here is my little graphic! On Tuesday we were asked to share our favourite lesson to teach. My favourite lesson is this labeling lesson by Julie Lee of Mrs. Lee's Kindergarten! I have done it every year and the kids always think it's hilarious ;) I don't have a good picture showing you the lesson but click on the link above and read her post for more information! On Wednesday we were asked to share a picture of where we work. On Thursday we were asked to post about our favourite teaching outfit. So here is one of mine! 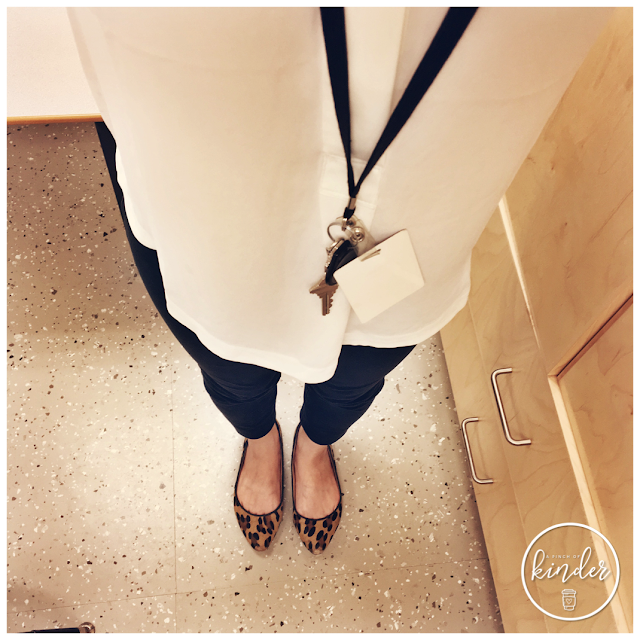 I love this blouse because it is machine washable! I also love these pants. If you are short like me (I'm 5'2 with very short legs) they are super comfy AND you may not have to hem them (wash them first before you get them hemmed because they shrank on me and now they are the perfect length!). These flats are also one of the only things that I can wear other than my TOMS that don't make my feet ache at the end of the day. They are not available right now but I think they bring this flat back from time to time. My school uniform is either a simple blouse + dress pants + flats (like above) or t-shirt + jeans + TOMS. On Friday we were asked to share about some of our favourite teacher friends. 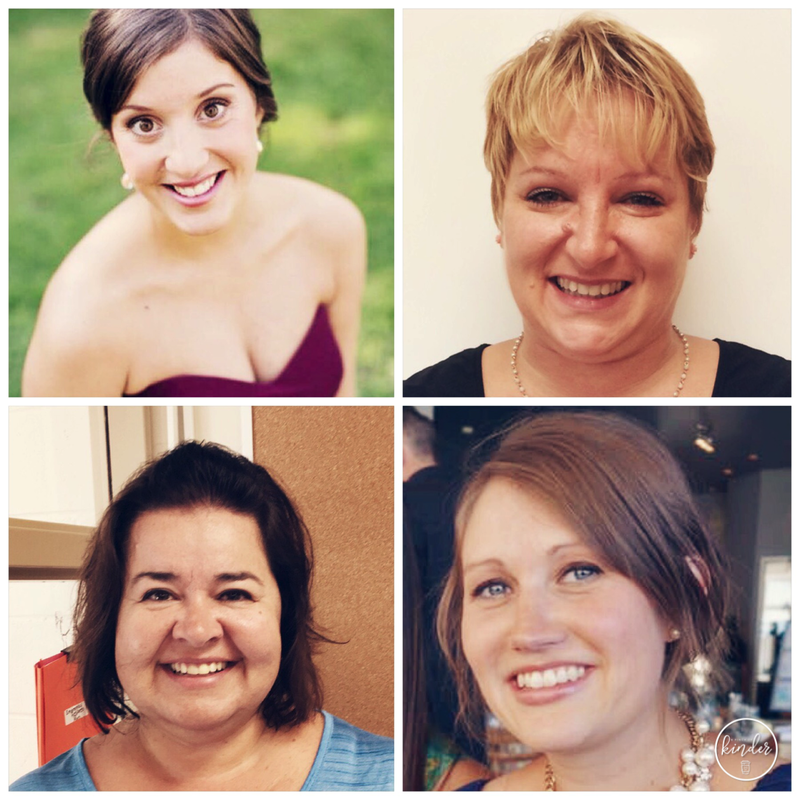 I'm going to brag on some of my amazing teacher friends that I have had the honour of knowing and working with! Amanda was my teaching partner when I was in my first LTO. 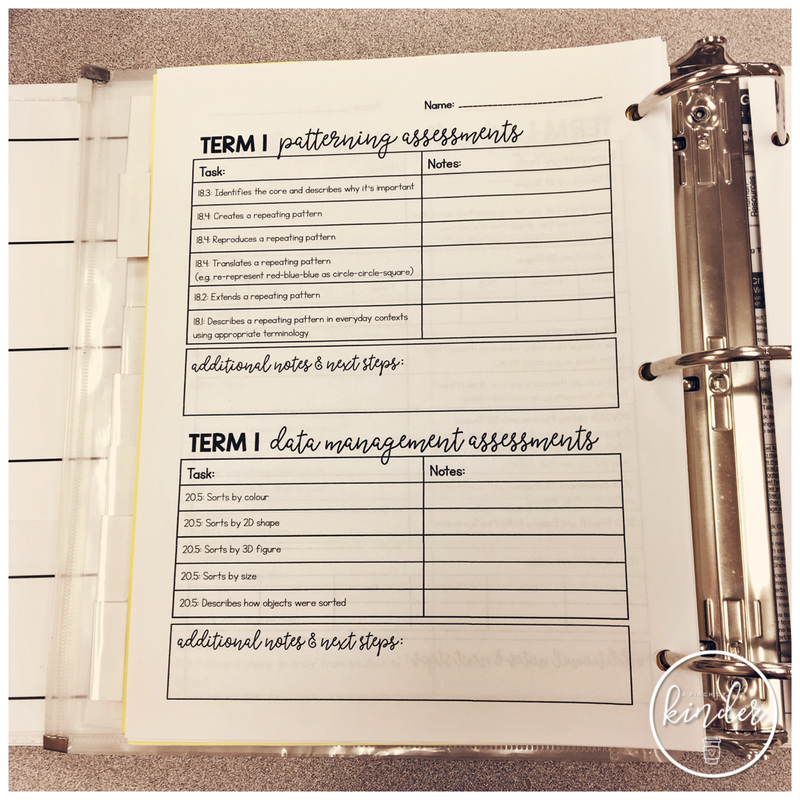 I took over a teacher going on maternity leave in October and was so overwhelmed with all the new learning of being a first time LTO and managing a class with many needs. She answered all my questions, picked me up for lunch every day (those who know me in real life know that I have a tendency to hermit in my room and not eat enough) and was just the best teaching partner that I could have ever asked for. I am so happy that we have kept in touch after our LTO's ended at that school and we have gone on to teach at different schools. Kellie was my ECE partner the last two years at my current school. She is both one of the most wonderful educators and people that I have ever met. She is so kind, hard working and hilarious. She programs for inquiry like a boss and I am so thankful to have had the opportunity to watch her teach and learn from her for two years. This year she is down the hall in another classroom and although I already miss her those kids in that classroom are so very lucky to have her as one of their teachers! Nicole joined our Kindergarten team last year and I could have not been more happy. 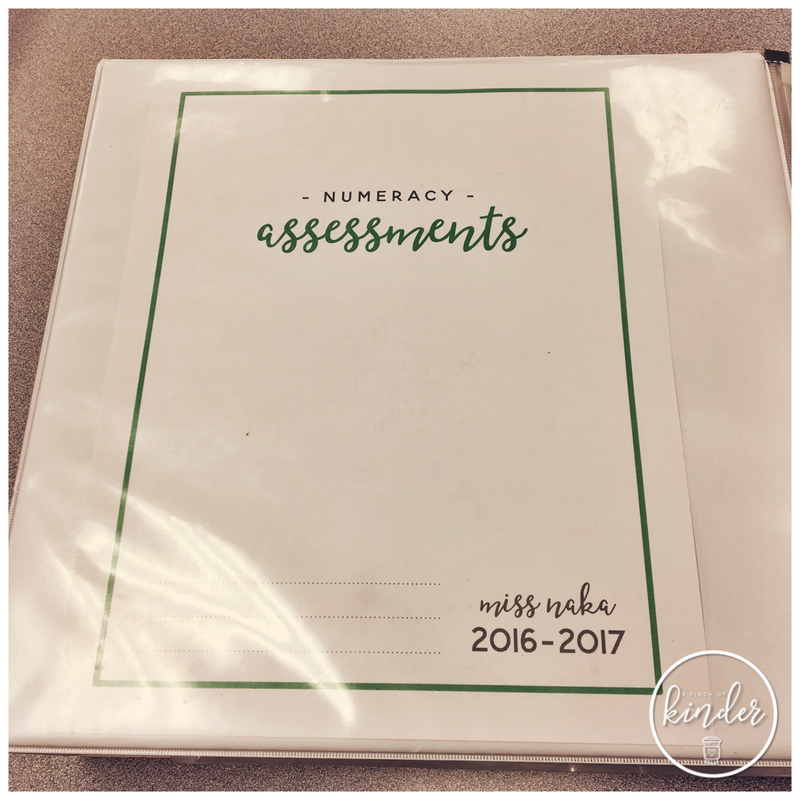 She is refreshingly honest and realistic about teaching Kindergarten. She constantly reminded me that it's ok to slow down and to work hard but also to appreciate time outside of school. She is hilarious and I miss her so much and our before/after school chats as she is on maternity leave this year. My lit coach asked me last year how I learned to be such a great Kindergarten teacher (first of all what an honour to be recognized like that..) and I told her that although I feel like I am far from a great teacher, if I seem that way it is because of the wonderful Kindergarten educators that I have had the pleasure to work with and learn from. These 4 are just a few of many who have made an impact on my teaching. 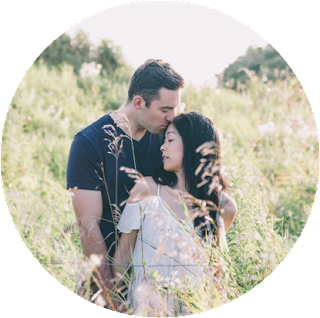 Thank you for reading my very wordy and long post! 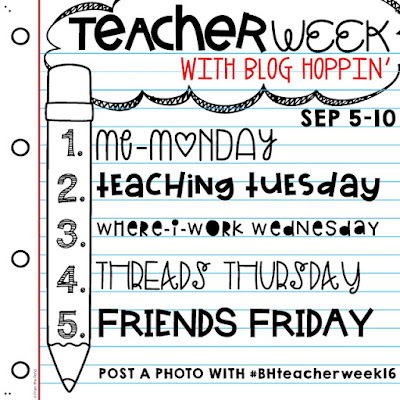 It's not too late to add your pictures so that other teachers can find you through the hashtag #bhteacherweek16 on Instagram! 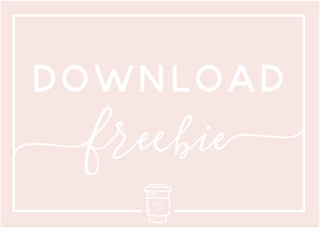 Or you can click here to visit more blog posts about the BH Teacher Week '16! I love when other people post about their classroom set-up so today I thought I would show you ours! This is the first year that I am in the same room as the year before. We had a set-up that worked well so we kept it very similar for now. This picture was taken before the first day of school. You can see that my walls are pretty bare! 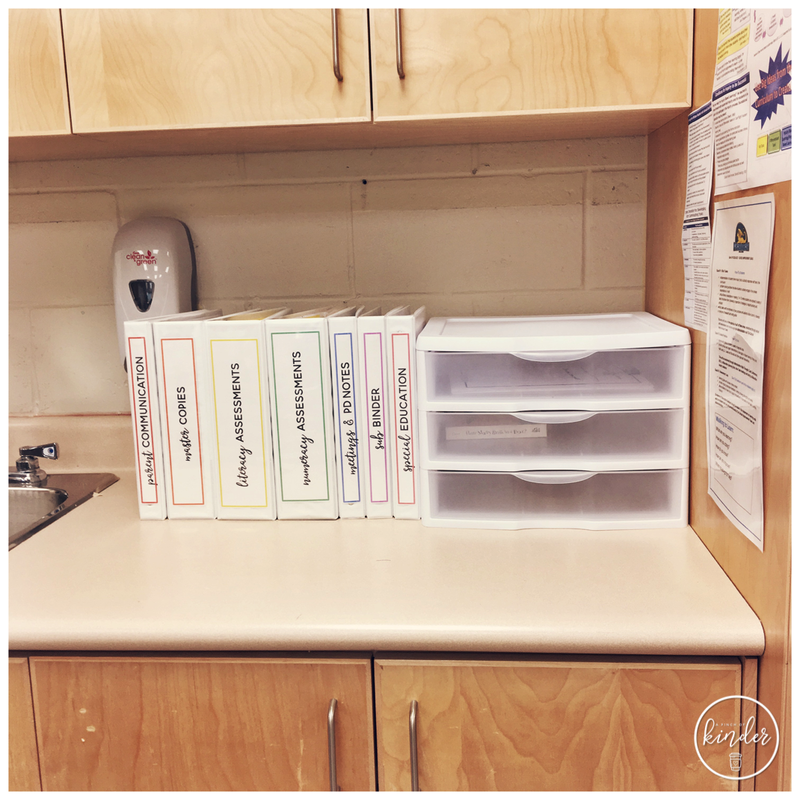 We will be filling them up with the student's work, co-created board titles and anchor charts very soon. 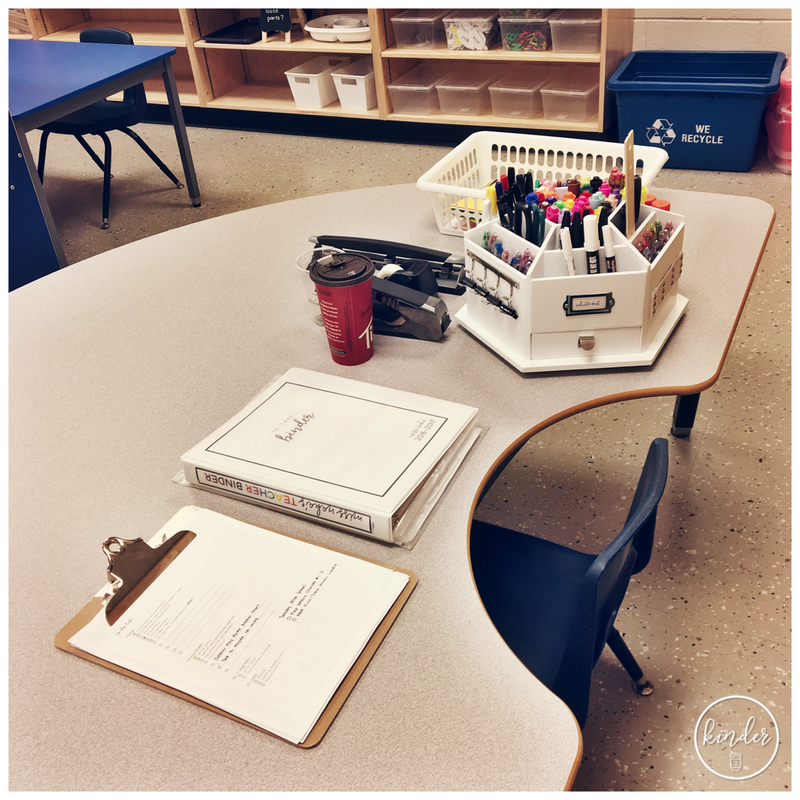 It will probably never be this clean until the last day of school..
On my desk, I keep a bin for misc. 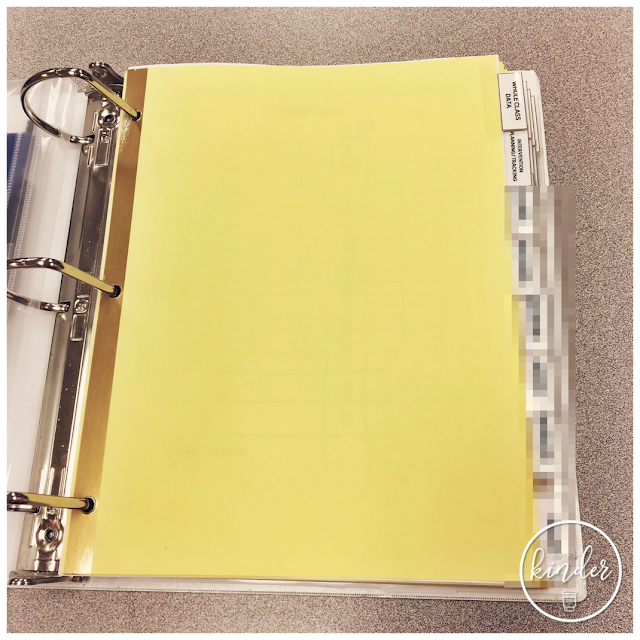 things that I need to look at before it gets filed/sent home etc., my supply caddie, my three-hole puncher, tape, stapler, my coffee, teacher binder and my clipboard (where I keep my weekly checklist and lesson plans/guided group plans for the week on). Behind my teacher table, I keep my binders and my sterilite drawers. You can grab my binder covers, spines and teacher binder printables by clicking here. Near my teacher table is our sand box. For the first week I decided to not open sand yet and instead, make this a lego table! 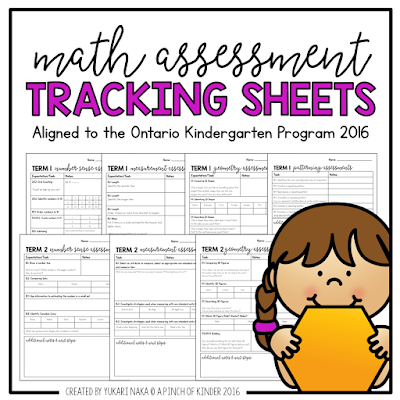 Students are encouraged to make a plan, draw their plan and draw their creations. Across from the sand table we have this grey table. 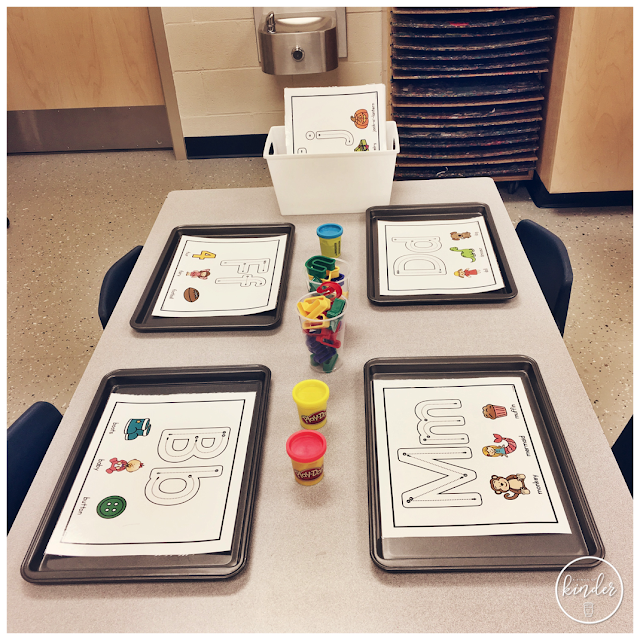 This week I put some alphabet play dough mats, alphabet cutters and play dough out for the students to explore. 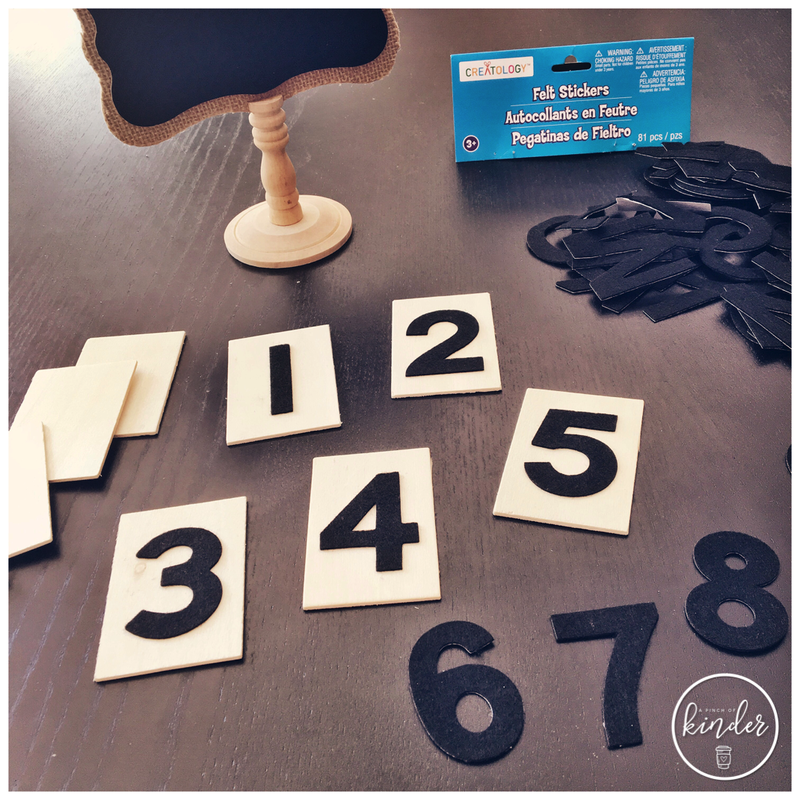 You can find these alphabet play dough mats in my TPT store here. 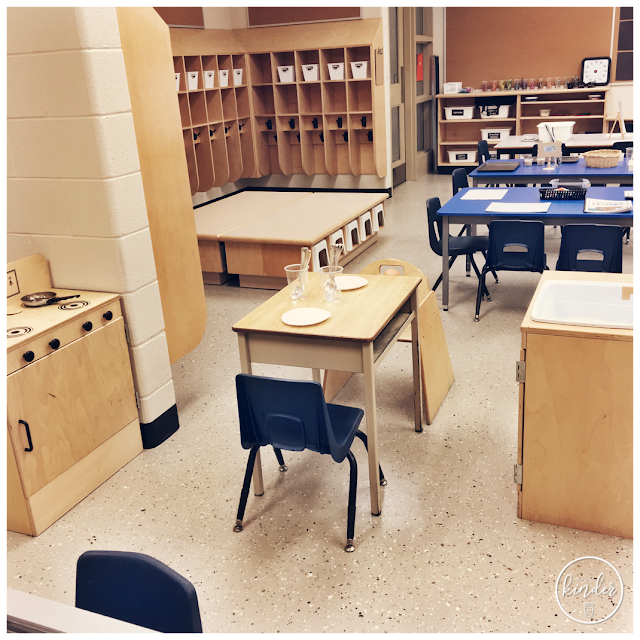 Our dramatic play centre is currently a kitchen. 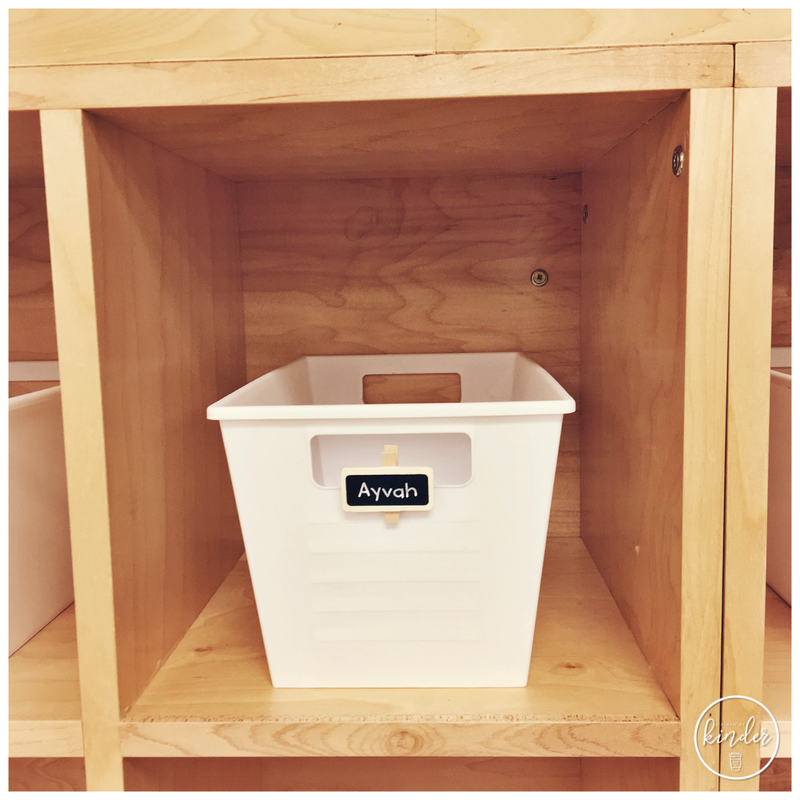 We have very few things in the kitchen to start and will be adding things with the kids. 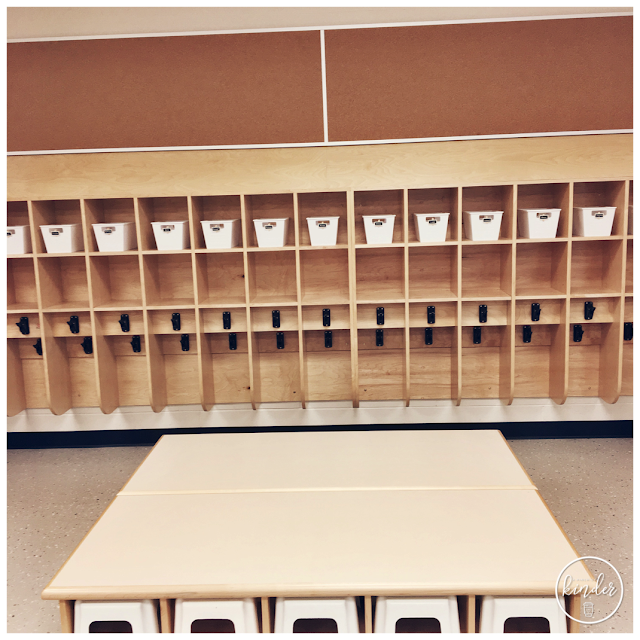 Here is our cubbie area! Each student gets a cubbie. 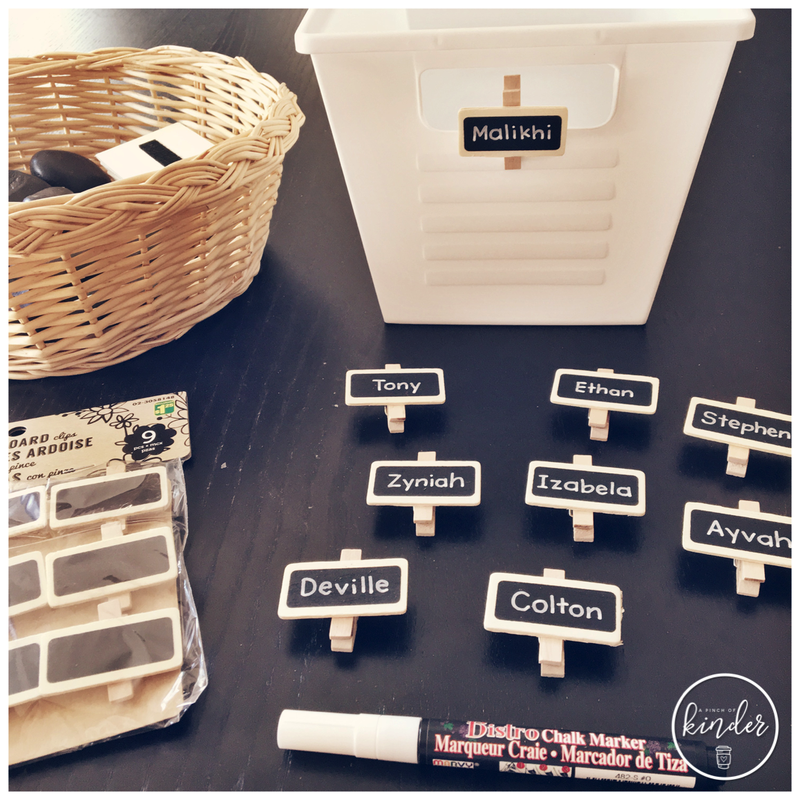 Their names are on the little chalkboard clips. Extra clothes go in the bin and their indoor shoes go in the box below. Outdoor shoes go under their cubbies. I got the chalkboard clips at Dollarama. For the first little bit I hand write the daily schedule. I take pictures during the first week and once we get into our normal routine, I post the daily schedule with schedule cards. Our word wall is under our whiteboard. 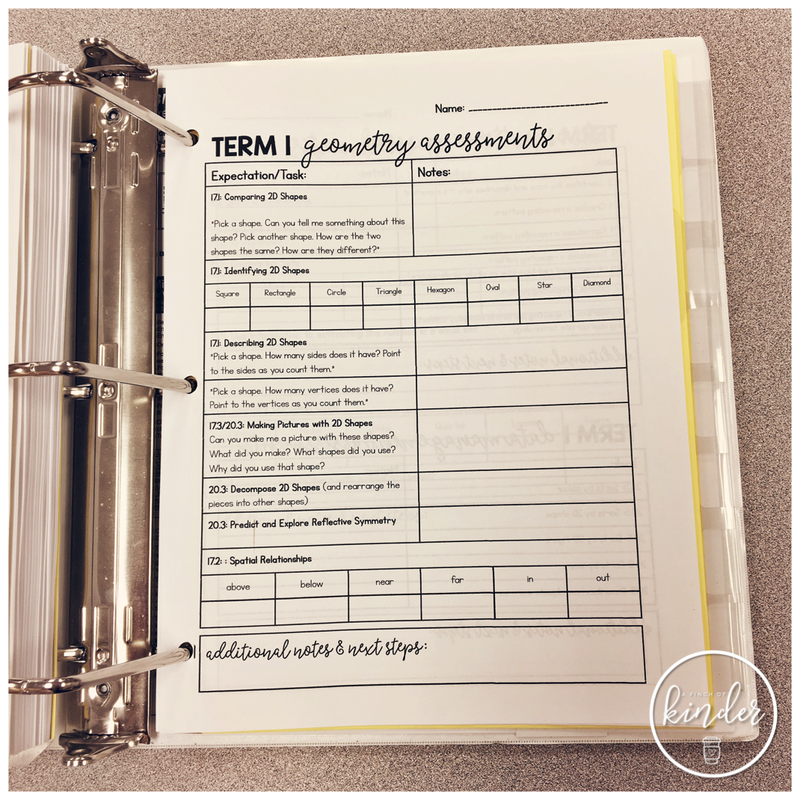 You can find my word wall pack here. 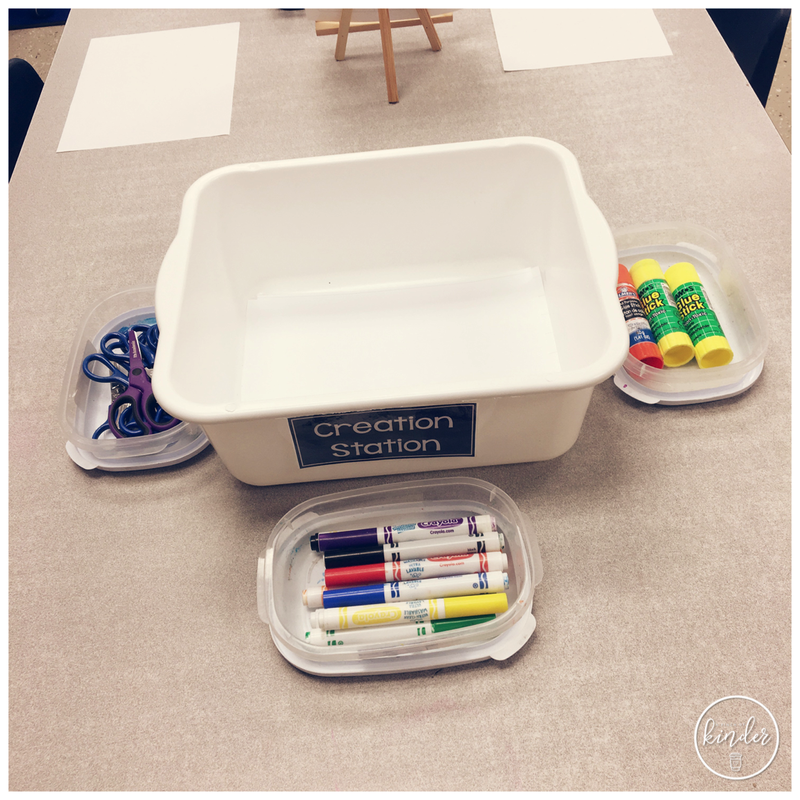 Our creation station is super simple right now. Just blank paper, glue, scissors, markers and crayons. 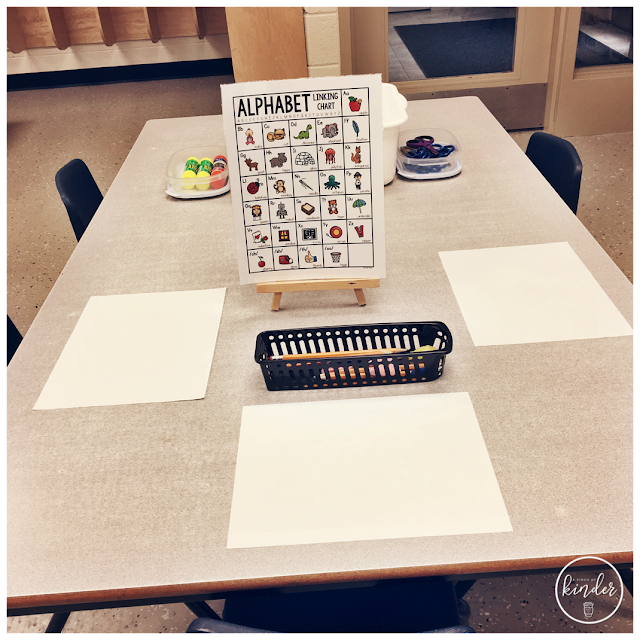 I put out the Alphabet Linking Chart at our writing centre this week for the kids to get familiar with it. I encourage them to draw a picture, label their picture and/or copy letters and words. This alphabet linking chart is included in my "Step by Step: Kindergarten Writing Plans". 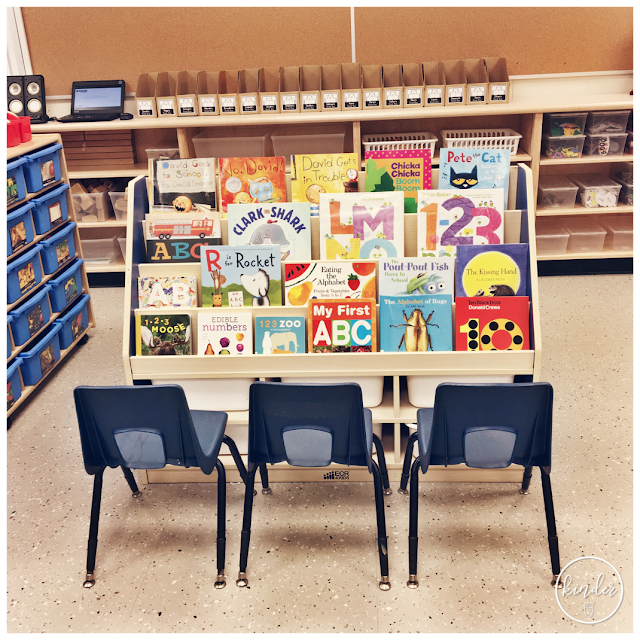 Here is another provocation I set-up on one of my tables. 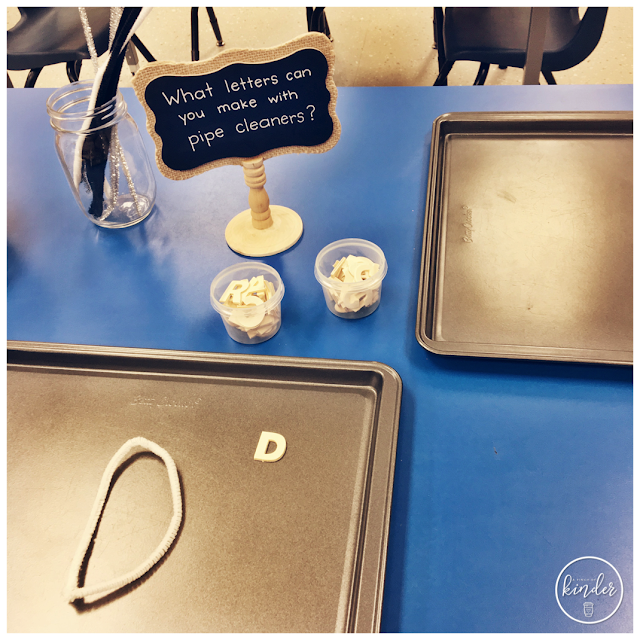 Students are asked to create letters with pipe cleaners. 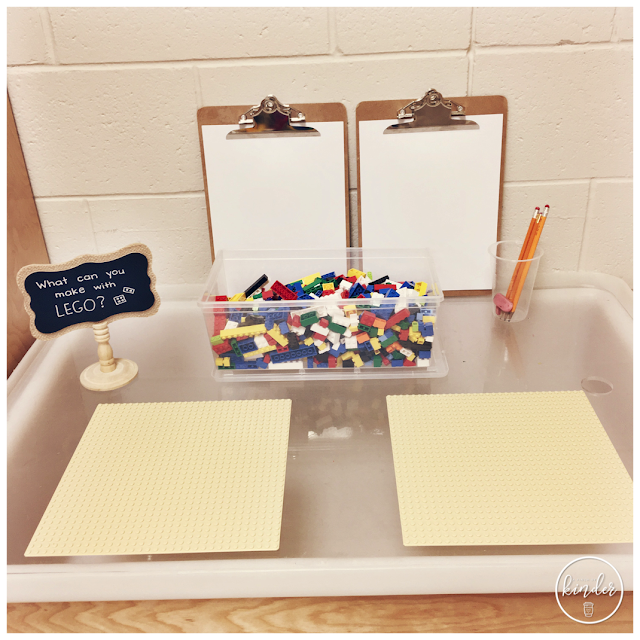 Great for fine motor practice and letter formation! I set the pipe cleaners out with these mini wooden letters that I found at my local dollar store. 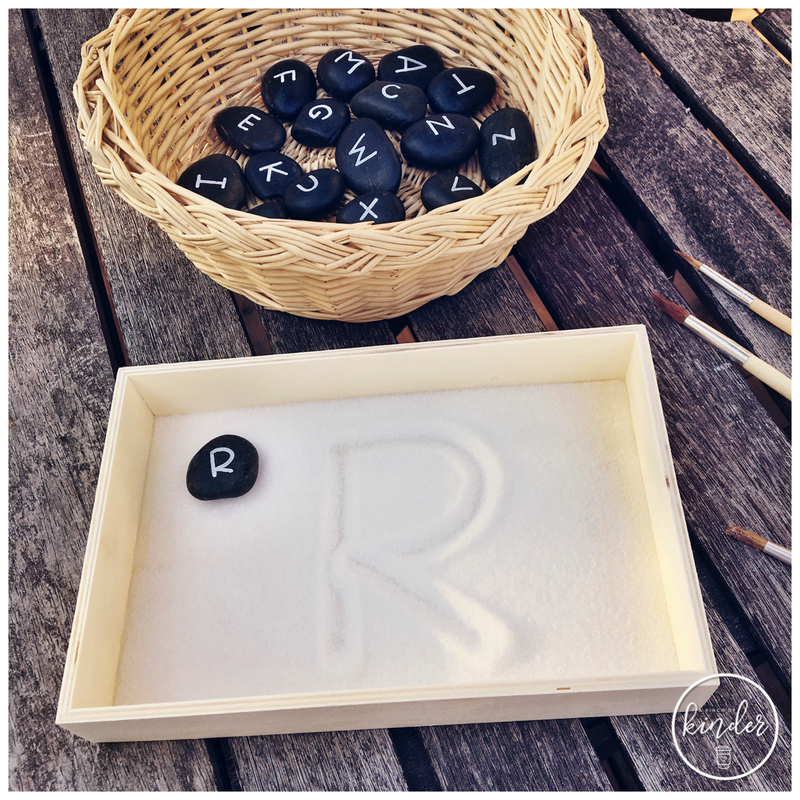 On the same table I also set out my alphabet rocks with salt trays. Students were invited to create words and letters in the salt with their fingers or with a paint brush. My kiddos love dry-erase boards and books so I always have this out! You can find the printing books here. We store our wooden blocks on this shelf. The bin on the bottom left has our building books and structure photos to use a reference when building. And here is our bookshelf for the first week! 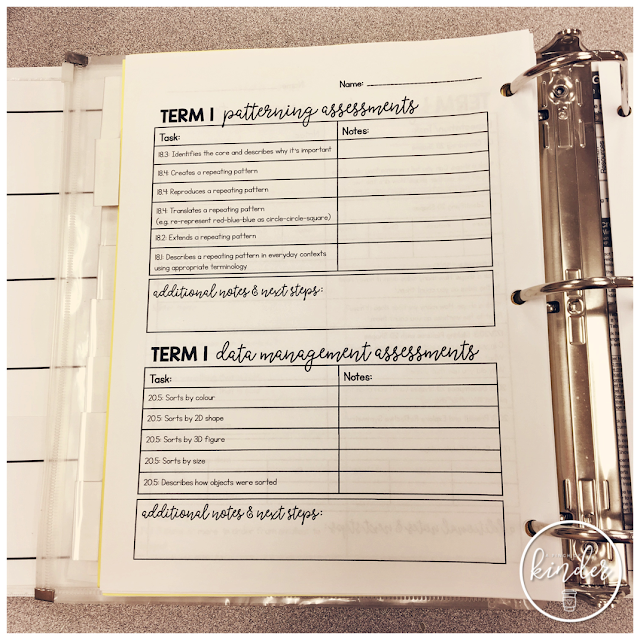 I change my books out weekly to keep the kids excited about reading at the bookshelf! That is my room for this year! 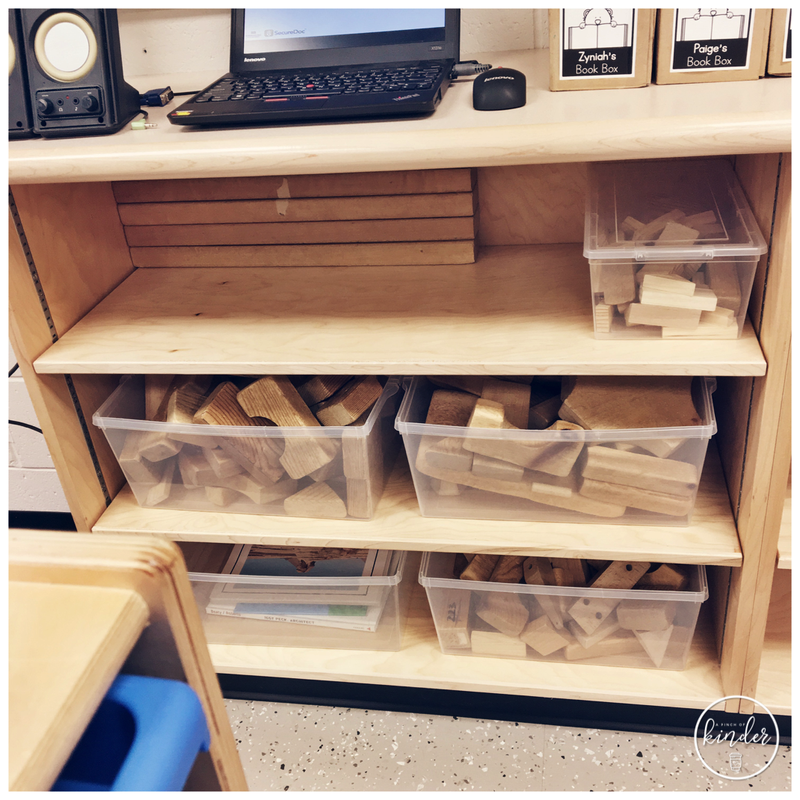 Of course it is just the "base" and the kids will be adding so much of their work and learning to this space to really make it "our" classroom. I can't wait to watch our classroom transform as the year progresses!